No classroom for these kindergarteners. 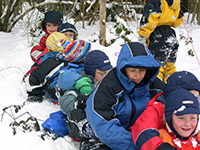 In Switzerland's Langnau am Albis, a suburb of Zurich, children 4 to 7 years of age go to kindergarten in the woods every day, no matter what the weather. This eye-opening film follows the forest kindergarten through the seasons of one school year and looks into the important question of what it is that children need at that age. There is laughter, beauty and amazement in the process of finding out. "This film captures the wonder and joy of authentic learning that occurs when children are afforded the luxury of time, space and nature. The young children display immense confidence, skill and competence. American educators will be challenged to reconceptualize the purpose of kindergarten - the curriculum and the learning environment - from the lessons of this distinctive classroom." "School's Out dramatically and skillfully provides American educators, families and policymakers with an alternative model for thinking about what engaging, active and effective social, emotional and intellectual education for young children can be. It wisely challenges us to reflect on what has been lost, both in and out of school, and what the consequences might be for today's children and beyond." "What a great way to show people the importance of outdoor play and exploration for young children! I hope all educators, administrators, and parents will watch this and take it to heart. The high stress on academics in early childhood just isn't necessary. Teachers, even if you can't teach your classes in the forest, take inspiration from this, your students and society will thank you." "Children who attend the forest kindergarten learn how to problem solve. They become independent. They explore the world with delight...Although they don't begin academic learning until age seven, they catch up with their American counterparts by the time they are ten. Do their American counterparts ever catch up with their Swiss peers to discover what children who attend the forest kindergarten have learned about the world and one another? This film poses serious and disturbing questions about what is being lost because of the now global preoccupation with the development of academic proficiencies at an early age." "This inspiring video shows how capable and empowered young children become when given support and freedom to play and learn in a natural educational setting." "Children appear to thrive in outdoor natural kindergartens...School's Out makes a compelling case that Forest kindergartens provide a model for how educational environments can support children's optimal development." "Though this documentary is especially important for adults, younger viewers will love learning about this non-traditional environment." "What the children gain is greater ability to socialize, resolve conflicts, use their imagination, cooperate, and understand the physical world around them...A delightful, nicely developed film that effectively illustrates the importance of play in a child's development. A useful purchase for collections that deal with primary and early childhood education." "This thought-provoking production offers interviews with parents, teachers, and a pediatrician who share the benefits of the outdoor experience as well as the concerns and challenges of these two early childhood educational programs. A nice addition to professional collections in elementary school media centers and public libraries." "An intriguing look at a different approach to early education...especially recommended for early childhood educators." "Through footage of the children and interviews with teachers, parents and child development experts, the film builds a powerful case for outdoor play...School's Out does an excellent job of arguing that outdoor play is wonderfully beneficial to kids' bodies, minds and souls." "Let's enjoy a lovely, hopeful image of cultivating kids' robust mental health. Travel with me to a little town outside of Zurich, Switzerland. There, a pre-school reliably grows healthy, resilient, confident, self-reliant problem-solvers...These kids will not be obese. They love nature. Their terrific social skills will reduce depression. They are not frightened by statistically non-existent stranger danger. The Swiss will not be paying for their preventable mental illnesses. But to give such experiences to American kids, we will have to get over our obsessions with safety, liability and getting every kid into Harvard. Which we should do anyway." "A powerful and beautifully crafted documentary that illuminates who children are, what's important to them, and what should be important to us as educators." "School's Out is a wonderful reminder about the most important developmental tasks of young childhood. These are about learning a mastery orientation to the world, understanding the consequences of behaviors, and figuring out how to handle frustration, delay gratification, and deal with failures. Then there's learning to work with others, figuring out plans and scripts-all a part of moving from parallel to negotiated play - and realizing how to collectively use each other's abilities. These are crucial life skills that children in the featured Forest Kindergarten are focused on each day." "Highly Recommended...Challenges the expectations we have of children and the traditional American school system...Allows viewers to observe the resilience of the students at play; naturally solving conflicts, participating in teamwork, and using tools with no prompting or guidance from an adult. Appropriate for child development and education classes and collections." "Every parent and teacher should see this film." "This film has touched me profoundly." "School's Out inspired me to found a forest kindergarten in my public elementary school." Robert Fulghum shows us the joy of climbing trees. "We should pause over...the implications of constantly channeling kids in a predetermined direction. This isn't just about reliance on technology - it's also a byproduct of the enormous anxiety parents feel about screwing up...Somewhere in our hearts, plenty of parents know that just can't be right - not all the time, anyway. That's why I'm so taken, I think, with a new 35-minute documentary about a forest kindergarten in Switzerland. Called School's Out: Lessons from a Forest Kindergarten, the movie is a provocative jumping-off point for discussion precisely because the schooling it documents seems inconceivable to American parents and educators." "There are no classes, or reading or writing. What there is, however, is learning...The film cleverly juxtaposes learning in a natural environment with the rigors of kindergarten for students in a typical North American setting."